Todd Lickliter was fired by Iowa after a number of transfers in recent years led to a 10 and 22 season. Lickliter was fired after only 3 years at Iowa with four years left on his contract, he took over for Steve Alford who was run out of town. Lickliter came to Iowa after 6 years at Butler where he looked like a rising star in the college coaching profession winning the College Coach of the Year in 2007. 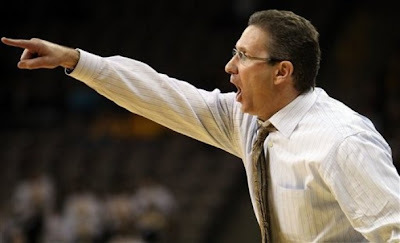 Lickliter looked like a great hire at the time for Iowa and maybe even a better coach than they should have hoped to have hired but it didn't work out as 4 players transfered last spring and another left last month after a series of suspensions. Of course the irony is that Steve Alford has quickly built a very good program at New Mexico. Iowa has stated that the search for a new coach is already underway, but who can they hope to hire? We don't think Iowa will be able to hire another rising star this time like Lickliter so the question is who will they hire, our guess is a top assistant from a major program who has never been a head coach. We would take a look at the assistant coaches at Michigan State,Ohio State,Purdue and Wisconsin, and of course there will be talk of going after Northern Iowa's coach.